The city of Nottingham surprises many of its visiting tourists, being home to a thriving fashion industry, numerous entertainment venues and clubs, and also a sports scene which rivals the country's very best. The nightclubs in Nottingham are also exceptional and amongst the region's liveliest, while the vast shopping centre is a major draw card for those who simply love to shop. Nottingham is famed for its historic 19th-century lace making industry, which was directly responsible for the city's wealth and central layout. Much of the tourism in Nottingham is based around the legends of the Sherwood Forest outlaw, Robin Hood, who has been made world-famous by a number of major Hollywood movies and televisions series. Even a road close to Nottingham Castle has been named after his love, being known as 'Maid Marian Way'. Friar Lane is also nearby and heads towards the Nottingham Tourist Information Centre (TIC) along Smithy Row, next to South Parade. 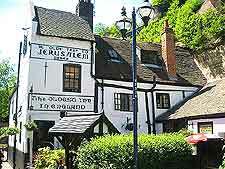 The tourist information centre offers a range of tourism advice and leaflets, many of which feature useful discount vouchers for the city's main tourist attractions. Nottingham's most impressive tourist attractions include guided tours, such as custom trips operated by the Nottingham Experience and a spooky Ghost Walk; National Ice Centre and Nottingham Arena - one of England's top ice skating venues, costing over £40 million when it was built; Broadway Cinema and Media Centre - featuring contemporary architecture and many regular screenings; and the Cornerhouse - a noteworthy entertainment venue with cinema complex, restaurants, bars and nightclubs. Further tourist attractions and landmarks in the city include Nottingham Castle - one of the city's most famous landmarks, with underground passageways and spectacular views of the cityscape; the Caves of Nottingham - numerous natural and manmade sandstone caverns, scattered around the city with various entrance points; Wollaton Hall - a grand Tudor-style mansion with large gardens, on the western side of the city; Ye Olde Trip to Jerusalem - one of the oldest pubs in the country, dating back more than 800 years; and Sherwood Forest Country Park - with many ancient oak trees and a popular visitors centre with information about the forest's history. 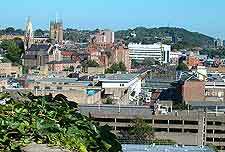 More information about Nottingham Tourist Attractions and Nottingham Landmarks. Some of Nottingham's best art galleries and museums include the Museum of Nottingham Life at Brewhouse Yard - with a host of information about the city's history, housed in a number of 17th-century cottages; the Museum of Costume and Textiles - known for its exhibitions of magnificent tapestries and elaborate lace work; Lakeside Arts Centre - a superb venue with three individual galleries and many varied exhibitions; and the Sherwood Forest Art and Craft Centre - situated in the heart of the forest and featuring works by many local artists. 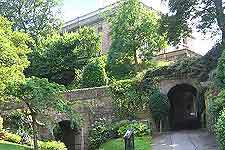 More information about Nottingham Museums and Nottingham Art Galleries. 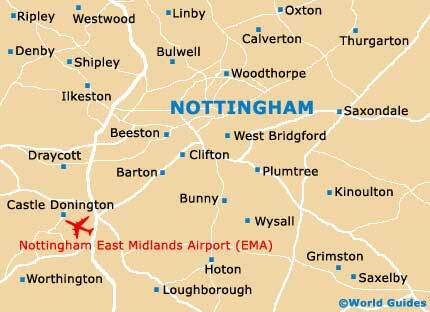 Many of the most visited tourist attractions close to Nottingham are the numerous surrounding market towns and villages in the county. These include the town of Eastwood - where the acclaimed writer DH Lawrence was born; Mansfield - the region's largest market town, with an appealing setting next to the River Maun; and Newark - where you will find 13th-century castle remains and a cobbled marketplace. More information about Nottingham Attractions Nearby.